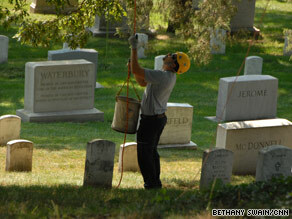 ARLINGTON, Virginia (CNN) -- The hallowed grounds of Arlington National Cemetery took on a different tone Monday -- the usually quiet and reverent resting place of fallen heroes was buzzing with volunteers, professional landscapers and their equipment during the annual "Renewal and Remembrance" project. Monday was the annual "Renewal and Remembrance" day at Arlington National Cemetery. "Renewal" was started more than 10 years ago by an Ohio lawn-care group that wanted to give a day of service to the cemetery outside Washington, according to Bill Hildebolt, spokesman for the Professional Landcare Network. "It's grown fantastically from a few lawn-care operators to today we had over 400 individual PLANET members," he said Monday. Each year, volunteers take on several projects during the service day, including spreading lime over nearly 300 acres of the cemetery and installing irrigation systems, Hildebolt said. While the 95 companies participating Monday may normally compete for business in the lawn-care market, during Renewal the crews work together to honor the service members buried at Arlington. "It's just a day of remembrance," said Jeff Dietrich of Pennsylvania-based Joshua Tree, who has been volunteering for four years. A crew of arborists from the Joshua Tree company took on one the most expensive projects -- protecting Arlington's biggest trees from lightning. "Lightning, electricity is unpredictable at best. ... It'll blow a tree apart." To protect a tree from lightning strikes, Dietrich and his crew climb up to the top of a tree and run copper wires down the trunk with anchors that resemble rifle cartridges. The wire is then grounded by a copper pole entrenched at the base of the tree. If lightning strikes, the electricity runs down the wire and dissipates into the ground instead of harming the tree. Even though it took the Joshua Tree crew longer to reach Arlington from Pennsylvania than the four hours needed to complete their work, the workers seemed eager for their chance to volunteer, cheering each other on while working and sharing some trade secrets with other crews. "How many people can say they get to come down to Arlington, especially if they're not from around here, and climb some of these trees?" said Deitrich. For Hildebolt, providing a service for the national cemetery is a way to make a national contribution. "It's a privilege," he said. "It's a very humbling experience that I'm very proud of."